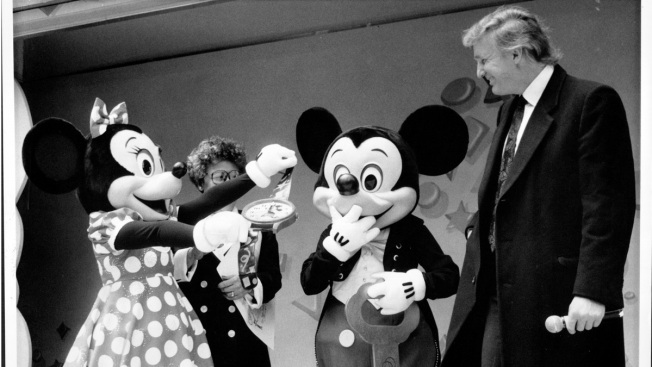 In this April 27, 1992, file photo, Donald Trump receives a watch (the retirement watch) from Mickey during the Walt Disney World 20th Birthday Surprise Party., which Trump hosted. An animatronic figure of Donald Trump has joined Disney's Hall of Presidents in Florida. The Orlando Sentinel reports that a robotic facsimile of the 45th president of the United States stood front and slightly off-center Monday for the soft reopening of the long-running Walt Disney World attraction. The Trump figure moves his head during the traditional roll call of leaders, motions with his arms and gives a brief speech. A Disney spokeswoman says Trump recorded his Hall of President's script earlier this year. Every sitting president since Bill Clinton has had a speaking part. The Hall of Presidents debuted at the Magic Kingdom in 1971 and gets an update with each change in leadership. After closing in January, the theater received an upgrade in its sound, light and projection packages. Disney has not announced an official opening date.